Between 1200 and 1413, 285 individuals held sees in England and Wales. Many of them made wills, appointed executors who administered their estates, prepared inventories and rendered accounts of their administrations. 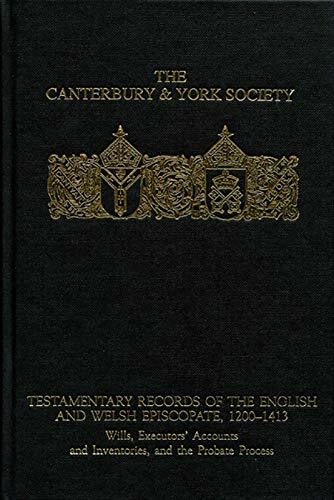 This volume edits all the unpublished probate material and provides a comprehensive overview of the surviving records. These deeply personal documents allow comparisons to be made across the late medieval episcopate. They demonstrate common patterns in terms of goods, styles of living and customary practices, as well as the power of devotion, intellectual interests and relationships between bishop and chapter. At the same time, they illuminate the devices that were employed to keep ecclesiastical property out of the hands of the Crown, and how to manage the business of church, diocese and family from beyond the grave. The documents are presented here with full introduction and explanatory notes. C.M. Woolgar is Professor of History and Archival Studies at the University of Southampton and Head of Special Collections in the University Library.